I started using Himalaya products about 3 years ago and was consuming their herbal capsules then, After that I discovered their shampoo (old bottle design), and now this one! 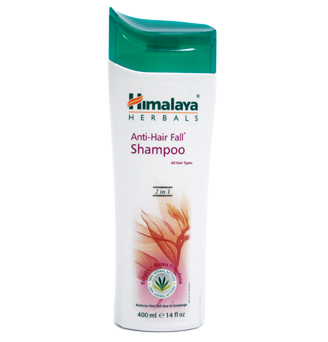 Himalaya Anti-Hair Fall Shampoo strengthens weakened hair and provides nourishment to roots. It improves hair texture and reduce hair fall due to breakage. Its innovative formula makes hair manageable and stronger. This shampoo can be used on permed or artificially coloured hair. It is suitable for all hair types. The first time I used this shampoo i did not like it because it wasn't very conditioning when washing, which makes it difficult for me to mix it around my scalp and hair. But it did help with my hair fall, and I noticed the difference when i use this shampoo and other anti-hair fall pharmacy shampoos! I read from other reviews that this shampoo drained the moisture out of their hair. In the beginning it was like that for me too but i noticed as i kept using the shampoo with conditioner, my hair actually became much easier to manage as compared to before. Before this I had terrible tangles, but after using this shampoo for a few weeks my hair looks and feel better now. If you're suffering from hair fall and are on a tight budget, I strongly recommend this shampoo. I also discovered a way to wash my hair with this shampoo without wasting. - What I do is i pour half of 10 cents coin and lather it to foam on my palms first, and then apply it on my scalp till there's no more foam on my palm. Then i'll do the same thing again and put it all over my scalp. - Once my scalp is covered with the shampoo, i'll pour a little more, lather in to foam and apply on my hair and massage my scalp for 1 minute, then rinse off. *If you have long hair, you must ALWAYS use conditioner when you wash your hair. I like this shampoo cause it contains more herbs than other pharmacy shampoo... and i also noticed the difference... feels more natural... haha... but using this shampoo requires patience cause when you wash your hair is slightly slower than usual... because it isnt very conditioning, but when you rinse the shampoo off hair feels kinda nice, for me la. Thank you for sharing this shampoo review. I'm searching a good anti hair loss product for my husband, because he is facing with this annoying problem. He tried quite many until now, but all were without any kind of results. Also, I've made an appointment for him to http://www.skinvitality.ca, because I've heard only great things about the doctors from there and I'm sure that he will see some changes. it really smells gd but there is no foam after a while rub it. i'm kinda headache with it as i have long hair...but the promoter told me tht this shampoo included conditioner in one bottle. however my hair is rough after rinse off...do you find that anti hair fall still working even you use with conditioner? it really smells gd but there is no foam after a while. i really headache with this problem. the promoter told me that conditioner is included in this bottle so i do not need to buy conditioner. however i have a long hair and it is really rough after rinse off. does it still work if i use it with conditioner?? coz i heard that conditioner is one of the reasons that cause hair fall. Conditioner does not cause hair fall... the reason why it appears like your hair drops more is because the conditioner is untangling the hair that has already dropped but tangled with your other hair. If you have oily scalp, be careful and do not let the conditioner touch your scalp.